When it comes to vehicles, it's essential that you have an understanding about tyre speed rating. What does tyre speed rating mean? Well, it's a system that indicates the maximum speed your tyre is legally approved for. Below you'll find exactly what all the letters and numbers of this rating mean, so that you can be sure the next time you buy car tyres, they're the perfect fit for your motor. Where do I find tyre speed rating symbols and what do they mean? The tyre speed rating is clearly displayed on the sidewall of each tyre and indicates the fastest speed that a driver should not exceed when their vehicle is fitted with this tyre type. This is either a letter or a letter and a number. Examples of the speed rating numbering system are A1 through to A8 in sequence, while the letters run from B to Y. 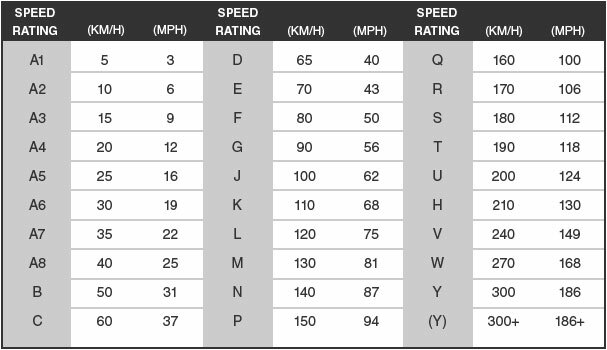 Our chart below provides the rating and the highest acceptable speed for the tyre in both miles per hour and kilometres per hour measurements. What tyre speed rating do I need? Most vehicles fit into the speed rating of S or T for 112 or 118 miles per hour limits (180 or 190 kilometres per hour). Wider, larger-diameter tyre speed ratings are often higher as they are usually fitted to higher-performance cars because they are designed to cope with higher speeds. Sports vehicles need tyres with speed ratings of W, Y or (Y). The ratings make sure that speeds not exceeding 168 miles per hour (270 kilometres per hour) are comfortably handled. If you frequently make short city-based commutes interspersed with the occasional leisurely ride, then you may choose a tyre with a lower tyre speed rating. However, this may affect your car insurance. On the other hand, if you regularly travel on the motorways, and hop across the country to visit clients, you may zoom on the outside lane to get there faster. In which case, you'll need a higher-rated tyre to handle these speeds. Use our 'Search by Registration' box to find your vehicle's tyre rating. How does tyre speed affect handling? You should only replace a worn tyre with one that has the same or a greater speed rating. The best quality tyres have superior ability to turn corners, better braking, grip on wet roads and more responsive steering. So, yes, tyre speed does affect handling. Why else are tyre speed ratings important? New regulations with the EU offer improved tyre information for buyers using the EU Tyre rating system. This ensures that understandable ratings for fuel efficiency, braking times in wet road conditions, and tyre noise levels are provided for each tyre. Here at Tyre Shopper, our staff can help you meet your exact requirements when you need to buy car tyres. We stock many tyre brands which helps our technicians to offer the widest selection of tyre choices to suit every vehicle. These radial tyres come at the lowest possible price online. See our price promise to see how we beat any competitors.